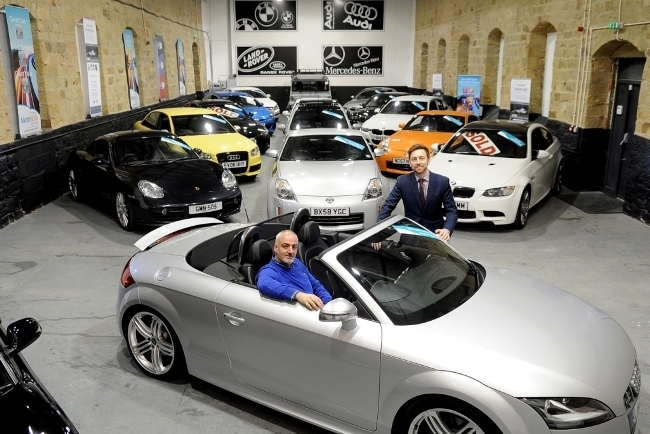 A West Yorkshire prestige car business has moved to new premises and positioned itself for growth, with support from Yorkshire Bank. SCC Leeds, based in Guiseley, is run by Remo De Biase, who has worked in the motor trade for more than 20 years. He has recently secured a six figure funding package from Yorkshire Bank to assist in growing the business, following the retirement of his business partner Roman Slobodian earlier this year. SCC Leeds buys and sells sports cars, 4x4s and saloons up to four years old throughout the UK. The business currently employs three staff but is hoping to recruit additional sales people in the coming months. The deal, which was arranged by Laurence Richardson, Relationship Manager at Yorkshire Bank’s Business and Private Banking Centre in Leeds, included the provision of a new overdraft facility to purchase vehicles and assist with the refurbishment of newly acquired rental premises. Managing director Remo De Biase said: “We are not a huge company and that allows us to be more considered when it comes to the vehicles we buy – I’m very particular in the makes and models we stock. We’re also very fortunate that much of our business comes from repeat customers, who will tend to look for a new car every 18 months to two years. David Maybury, head of Yorkshire Bank’s Business and Private Banking Centre in Leeds, said: “Remo is a long-standing customer and someone we’ve worked closely with over the last few years. As his business model has changed, we were happy to support his plans and will continue to consider any new opportunities to grow in due course. Yorkshire Bank recently launched a series of lending initiatives for UK businesses, designed to encourage growth for new and existing customers. As well as capital-free periods for up to five years, the Bank has also introduced high percentage funding for businesses to purchase trading premises. Yorkshire Bank has also strengthened its support for UK SMEs by becoming the first to partner with the British Business Bank under its ENABLE Guarantees scheme. Up to £125m of new lending by Yorkshire Bank will help more small businesses achieve their growth ambitions.